Did you know that 1 in 14 adults has some form of asthma and 2 million children alone visit a physician’s office for asthma treatment?. Asthma-related office visits accounted for 6.2 percent of all physician visits in 2015, per the CDC, representing close to 9.6 million people. There are few things more intimidating, scary, stress-inducing for patients than an asthma attack. During an asthma attack, a person’s airways become tightened to a point of severe asphyxiation and requires immediate medical attention as well as an inhaler. 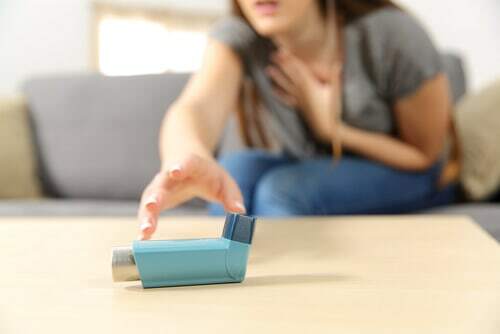 Without an inhaler, a person experiencing an asthma attack may require emergency medical attention. Thankfully, most asthma attacks are minor and only require the use of an inhaler to reverse an asthma attack. An inhaler is a medicated device that relieves asthma symptoms through nasal or airway administration. The patient experiencing an asthma attack has to self administer the device by pushing a button. Additionally, there are other types of inhalers including nasal sprays and neutralizers depending upon the severity of the patient’s asthma. If a patient’s symptoms do not start to go away after using an inhaler, call 9-1-1 immediately. This usually means that person is having a severe asthma attack that requires emergency care. One of the most effective ways to reduce asthma is to address potential asthma triggers in your household. In our previous blog, we laid out all of the most effective ways to lower triggers. Proactive care, awareness, and learning the signs can help you address asthma attacks at all times!